A summary of the patterns and definitions of DDD. Available in print or as a free PDF. covered. It is intended to be used as a complement to books and other resources available to those learning about DDD. 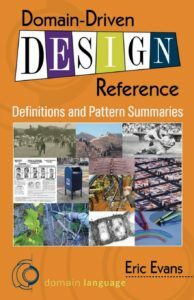 The DDD Reference contains a brief summary of every definition and pattern in Eric Evans’ 2004 book, plus three patterns that didn’t make it into the original book, which Eric now thinks of as part of his understanding of DDD. The DDD Reference is available in two forms. You can download the text as a PDF, or you can buy a print copy from various sources, such as here. The print version has illustrations and nicer formatting, but the text is exactly the same. Furthermore, you are free to copy the text and use it under the Creative Commons Attribution license. DDD Reference by Eric Evans is licensed under a Creative Commons Attribution 4.0 International License. The summaries in the DDD Reference are derived from text extracted from the 2004 book, and placed in the Creative Commons back in 2006.
prefer the newer version above.